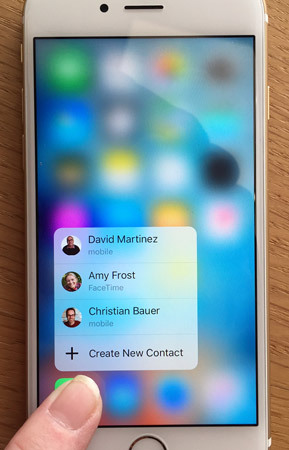 New with iPhone 6s/6s Plus comes 3D Touch and Quick Actions. These are made possible by the multi-touch screen. 3D Touch allows you to get different results depending on the amount of pressure you apply to the screen, and get feedback on your actions with taps from the screen. 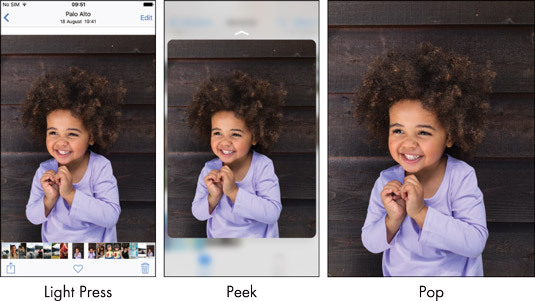 For example, if you open the Photos app, you can tap lightly to select a photo, press a bit harder to see a preview of that photo, and press harder to open the photo full screen. The ability to preview items such as emails, websites, maps, and photos before opening them can save you time. The medium press is called a Peek and the hard press is called a Pop. Quick Actions involve pressing an icon on the screen to see items you’re likely to want to select. For example, if you press on the Phone icon, you’ll get a shortcut list of commonly called contacts. If you press on the Maps app, you see a list of places you often go, such as your home, to quickly display a map of that location. Quick Actions provide a shortcut menu to your most frequently used items, saving you time and effort.